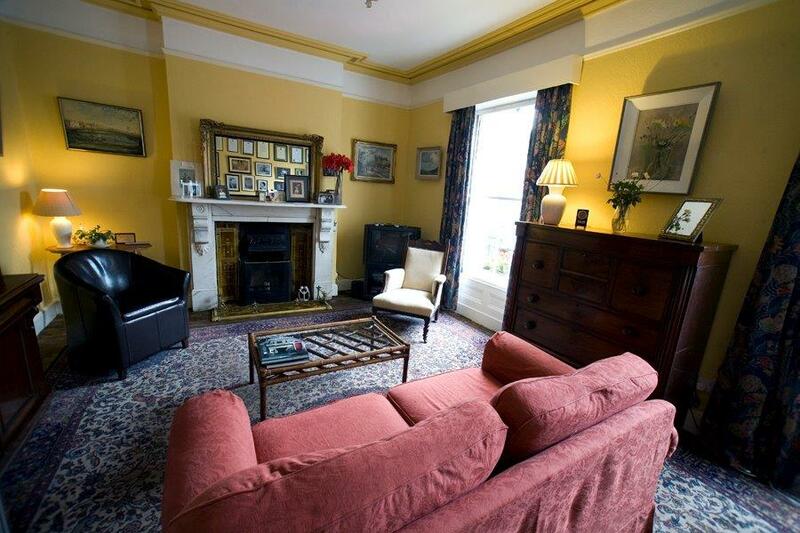 The Saddler’s House is a well-preserved mid-Victorian building with seven en-suite bedrooms. Three are twin rooms, with two single beds in each, and four rooms are double bedrooms with one double or queen bed in each. 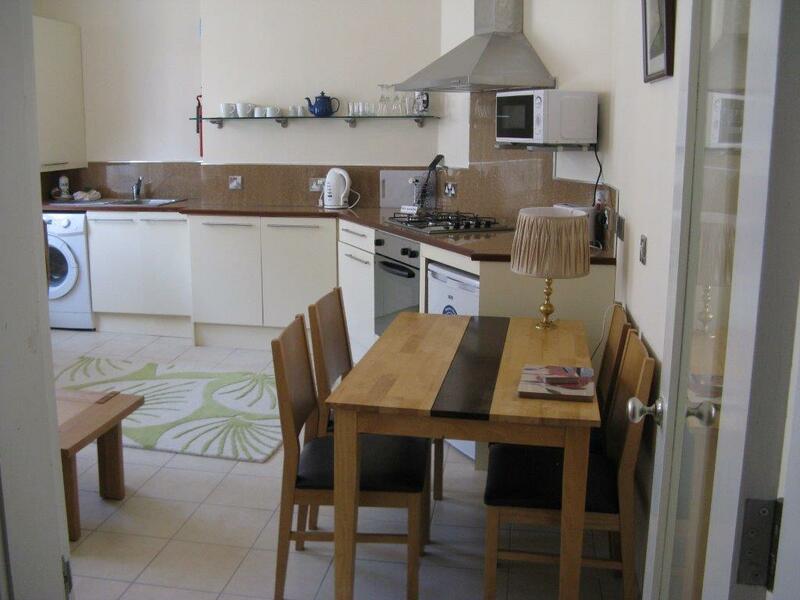 All bedrooms have central heating, tvs, hairdryers, tea and coffee-making facilities, and free internet access. Some of the bathrooms are small because of the constraints imposed by the original room layout. 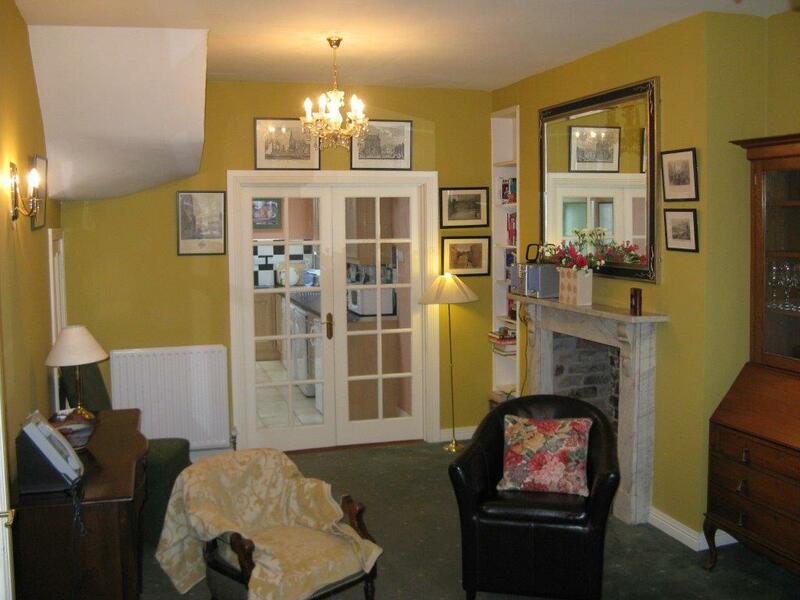 There is an elegant sitting room or parlour on the first floor with a large collection of family photos. The room’s generous dimensions and its imposing marble fireplace indicate that the first owner, William Dickson, a saddle-maker by trade, was a man of comfortable means. Here guests can avail of a PC and desk for free internet access, as well as a selection of travel books and reading material and a television. A tasty breakfast is served in the dining room where guests can enjoy a wide selection of freshly-cooked food, much of it locally sourced. The bright light-filled modern layout of this area provides a surprising contrast to the more Victorian feel of the rest of the house. Guests at the two dining tables have an opportunity to exchange stories and experiences, and lively conversations frequently ensue. The small walled garden at the rear provides a pleasant retreat in summer months. Bruno, our amiable resident bulldog, is happy to greet those guests and their children who are canine friendly. Parking is not usually a problem as there is free unrestricted car parking on the opposite side of Great James Street. Pets are welcome to stay with their owners at no extra cost. Our staff members provide laundry facilities, at a moderate price, to guests staying longer than one night. 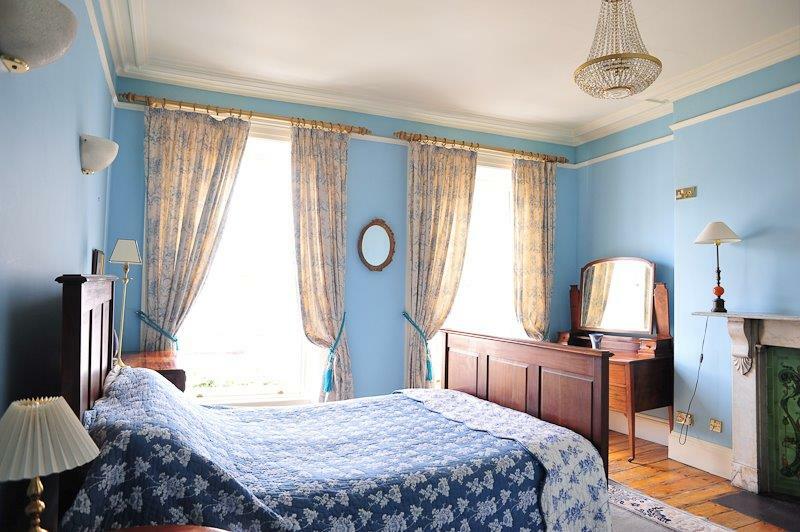 The Merchant’s House is an elegant restored Georgian-style B&B with high ceilings and intricate plasterwork. It has eight guest bedrooms painted in warm, vivid colours, spread over four floors, and seven of these bedrooms have their own en-suite bathrooms. There are two double en-suite bedrooms (1 double bed in each); two twin en-suite bedrooms (2 single beds in each); two triple en-suite bedrooms (1 double bed and 1 single bed in each); 1 en-suite family room (2 double beds and one sofa bed), with its own adjoining kitchenette; and 1 single room, with the bathroom outside the bedroom. Some bedrooms sport marble fireplaces and all have central heating, TV, tea and coffee-making facilities, a hairdryer, and free internet access. A patio balcony overlooks an enclosed plant-filled courtyard at the rear of the house. This provides an attractive outdoors venue when the weather permits. 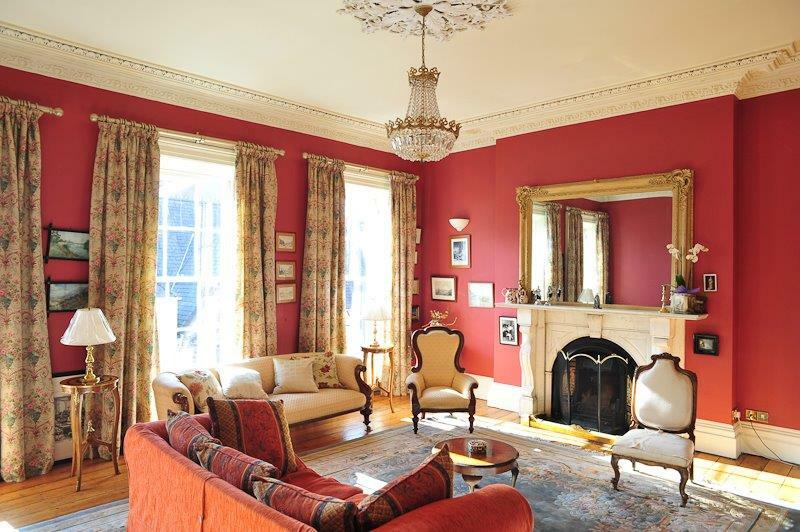 Ornate plasterwork, marble fireplaces, antique furniture, old portraits, and prints enhance the period feel of the house. The building’s listed status imposed limitations on the improvements that we were able to carry out. There is no lift/elevator, for example, and so this tall house may pose a challenge to visitors with mobility problems. Some bathrooms are small because of the constraints of the original room layout. The ground-floor dining room, with its original plasterwork, retains the elegant proportions of the Georgian era. King Edward VII, while Prince of Wales, is said to have had tea in this room. Today, guests breakfast together at the large dining table and animated conversations frequently ensue. The spacious first floor drawing room or parlour hints at the gracious lifestyle of the city’s merchant’s class a century and a half ago. This lovely room, stocked with a range of travel guides and books, provides an ideal setting in which guests can relax, talk or read. In 2009 we renovated the old kitchens in the cellar, transforming them into three en-suite modern bedrooms, with white-painted stone walls. During the summer months floral window boxes add a splash of colour to the building. The house is open for public viewing on European Heritage Day each September. Pets are welcome. A washing machine and dryer are available at a moderate cost to guests staying for two nights or longer. Free on-street car parking is close at hand in Clarendon Street. There is also a low-cost surface car park on nearby Strand Road. Many well-preserved Georgian-style buildings are to be found in the neighbourhood, which has been designated a conservation area. Cathedral Cottage is a compact three-storey townhouse dating from the late 18th century, with a fully-equipped kitchen, a living/dining room, and a toilet on the ground floor. There is an en suite double bedroom (1 double bed) on the first floor, and an en suite triple bedroom (1 double bed and 1 single bed) on the second floor. 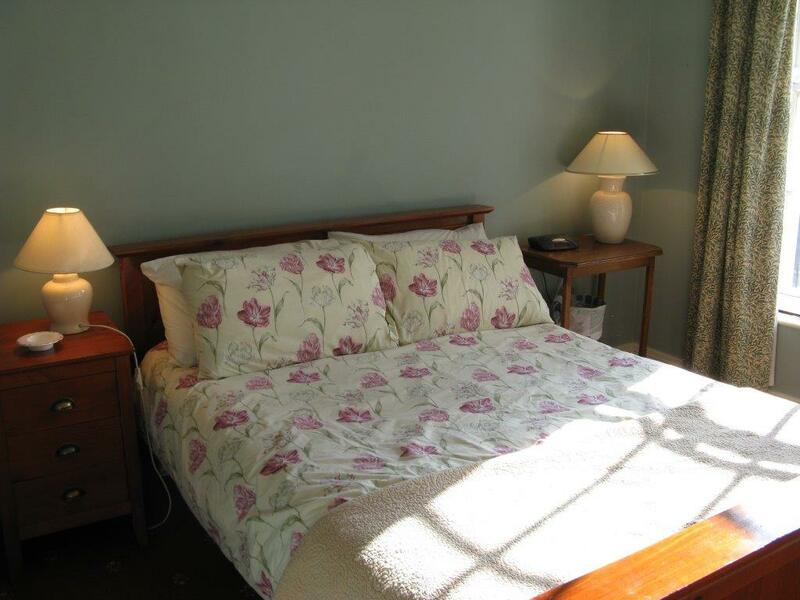 The Cottage can comfortably sleep 5, and an additional sofa bed is available in the living room. The bedrooms and the living room are equipped with TVs, and guests can avail of free WiFi access throughout the house. Gas central heating is included in the rental cost. 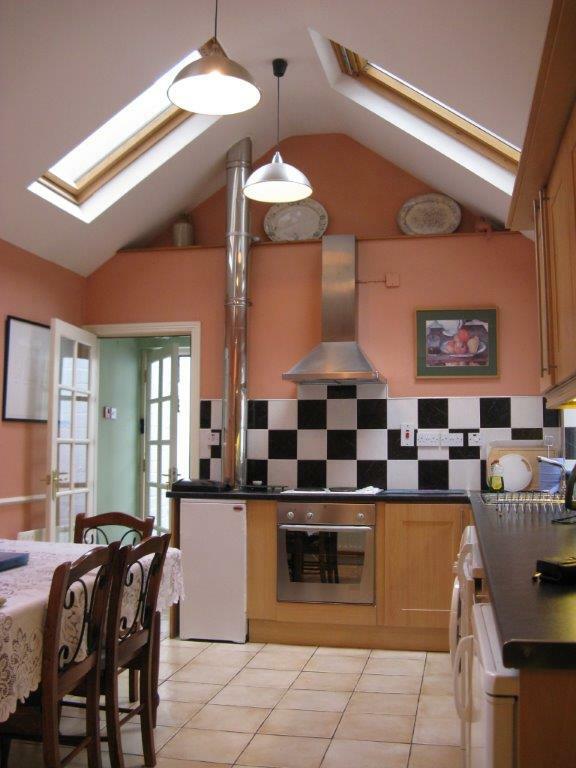 The kitchen is fully equipped and has a washing machine, fridge-freezer, gas hob, electric oven, and a microwave oven. Pieces of old furniture enhance the period feel of the building. Because of its central location, car parking in London Street is restricted to one hour during weekday working hours (8am-6pm). There is, however, an inexpensive car park located opposite the courthouse in nearby Bishop Street, and parking has not been a problem for guests staying in the Cottage. Pets are welcome to stay at no extra charge. A small walled yard at the rear, shared with the neighbouring Darcus Cottage, leads to the Garden of Reflection in Bishop Street. Darcus Cottage, a picturesque late 18th century building, has 4 bedrooms, with 7 beds and 3 bathrooms, and can comfortably accommodate up to 8 guests. 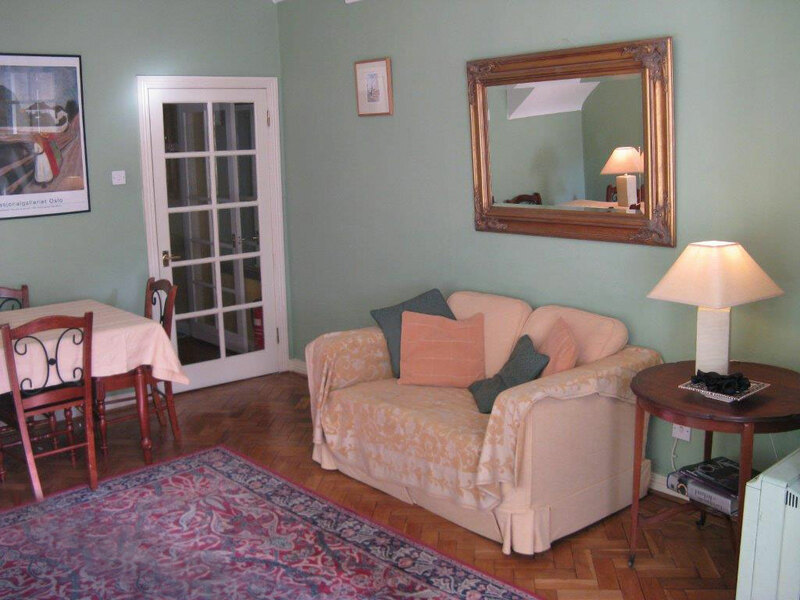 There is a large attractive living room on the ground floor adjoining a bright and airy kitchen/dining room. The en suite bedroom in the basement, whose rough stone walls suggest a late 17th-century origin, has a double bed and 2 single beds. 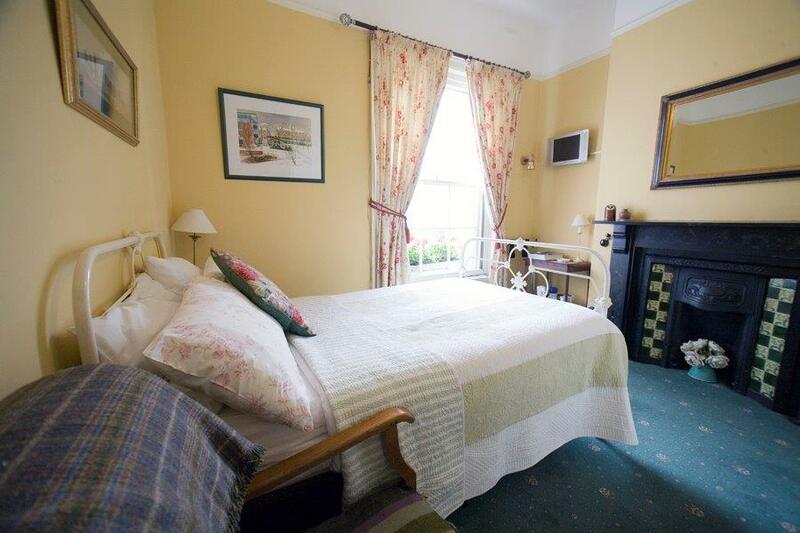 An en suite twin bedroom (2 single beds) occupies the first floor. Two double bedrooms (1 double bed in each) on the second floor share a bathroom between them. Because of its narrow staircase and rooms spread over four levels, Darcus Cottage could be challenging for guests with mobility problems, or for families with small children. Most bedrooms have tvs as does the living room. Free WiFi access is available in all rooms and the gas central heating system keeps the house warm on the coldest of nights. The fully-equipped kitchen has a dishwasher, fridge/freezer, washing machine, dryer, an electric oven, a gas hob and a microwave oven. Pieces of period furniture add to the building’s antique charm. Because of its central location in London Street, car parking is restricted to one hour during weekday working hours (8am-6pm). However, there is a low-cost car park located opposite the courthouse in nearby Bishop Street and parking has not been a problem for guests in the past. Pets are welcome to stay at no extra charge. . A small walled yard at the rear, shared with the neighbouring Cathedral Cottage, leads to the Garden of Reflection in Bishop Street. The Pump House contains 3 apartments, each with two bedrooms and two bathrooms, on the first, second and third floors of a 19th-century listed building in the commercial heart of the walled city. These bright and spacious units have been equipped and renovated to exacting standards. Each apartment has a double bedroom (1 double bed) with an en suite bathroom, and a twin bedroom (2 single beds) with its own separate bathroom, and can comfortably sleep four guests. 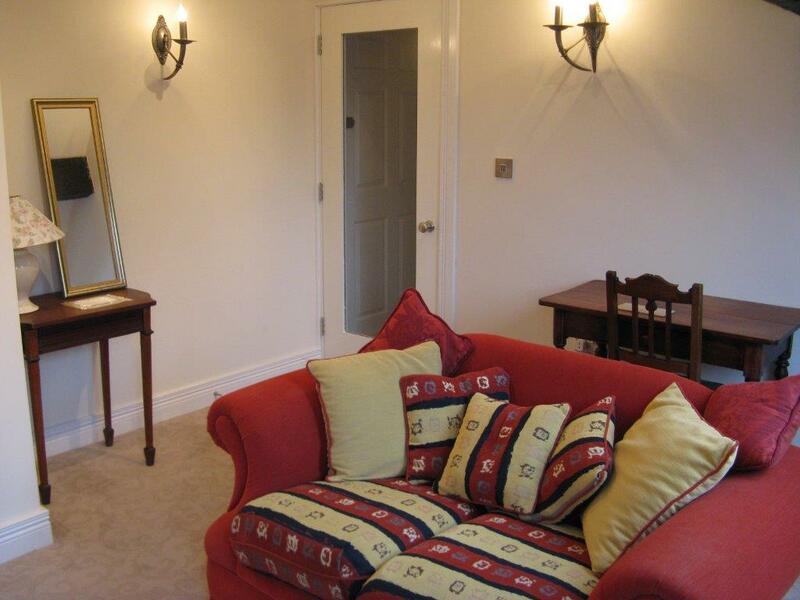 A sofa bed in the living room allows for additional sleeping accommodation if required. All three apartments have an open-plan living room/dining room/kitchen area. The modern kitchens are equipped with a washing machine, fridge, electric oven, gas hob and microwave oven. Apartment A on the first floor has a smaller living room than its counterparts on the upper floors but compensates for this by having access to an interior courtyard. The twin bedrooms at the rear of Apartments B and C have balconies overlooking this courtyard. There is free WiFi access in all apartments which are also equipped with tvs. A gas-powered central heating system provides warmth and comfort. A small lift from the first floor serves the top two apartments. Pets are welcome at no extra cost. A contemporary mosaic in the stairwell by a local artist provides a modern counterpoint to the building’s 19th century features. Because of its central location, car parking is restricted in Pump Street to one hour during weekday working hours (8am-6pm). However, there is an inexpensive car park located opposite the courthouse in nearby Bishop Street which has been availed of by guests in the past.